Marjorie King, PhD, PT: "Breast Cancer Survivors and Exercise"
Janice Cormier, MD: "Update on Lymphatic Surgeries" & "Implications of Lymphedema on QOL of Melanoma Survivors"
Caroline Fife, MD: "Wound Care for the Lymphedema Patient: What's New?" & "The Patient with Big Legs: Lipedema or Lymphedema?" 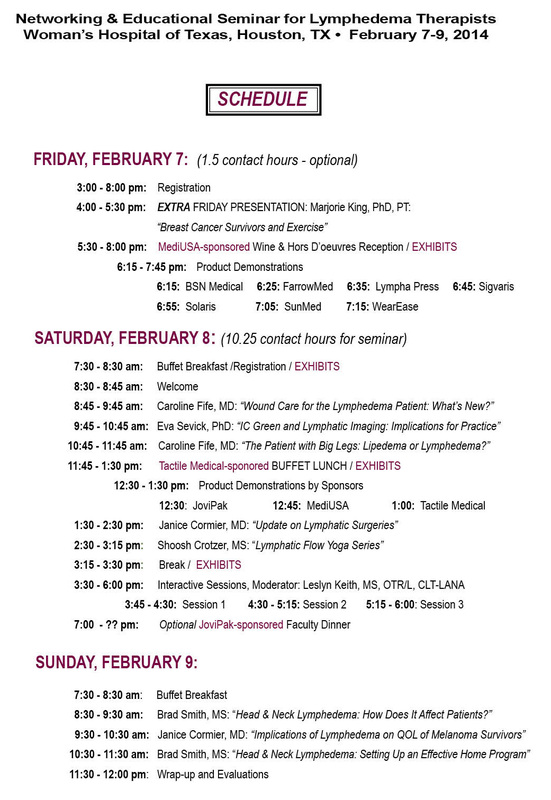 Eva Sevick, PhD: "IC Green and Lymphatic Imaging: Implications for Practice"
Brad Smith, MS: "Head & Neck Lymphedema: How Does It Affect Patients?" & "Head & Neck Lymphedema: Setting up an Effective Home Program"
List 3 diagnostic studies or tests which might be indicated depending on clinical history. Outline the indications for home program management vs outpatient treatment in patients with H&N lymphedema. Identify relevant anatomy of the head and neck lymphatic system and the upper aerodigestive tract. Demonstrate the use of emerging NIRF lymphatic imaging techniques to visualize normal and diseased lymphatic function. Demonstrate how therapy (MLD and PCDs) impacts lymphatic function as seen with NIRF lymphatic imaging in Lymphedema subjects. Understand how imaging the lymphatics can be used to discover genetic causes of primary lymphedema.